With two weeks left in the season, it's time to consider the candidates for each of the league's regular-season awards. We will start with the Kia NBA Most Improved Player Award. This isn't a case for or against any particular player. It's just a dive into some of the relevant numbers for consideration. We'll start pretty simple. 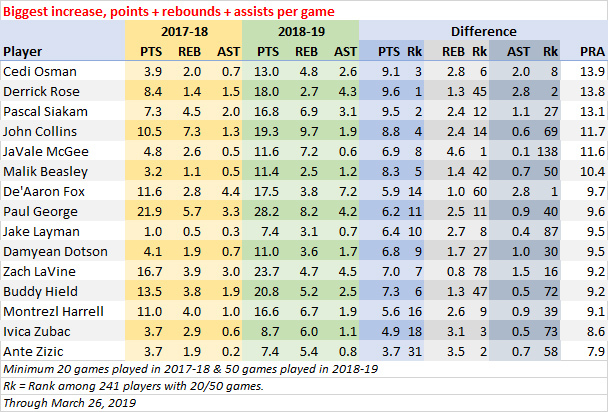 Here are the 15 players who have seen the biggest increases in points + rebounds + assists per game from last season. For some of the players listed above, it's all about minutes. Cedi Osman has seen the league's biggest jump in minutes per game, from 11.0 last season to 32.1 this season. In fact, the only player above who doesn't rank in the top 33 in regard to minutes-per-game increase is Paul George. 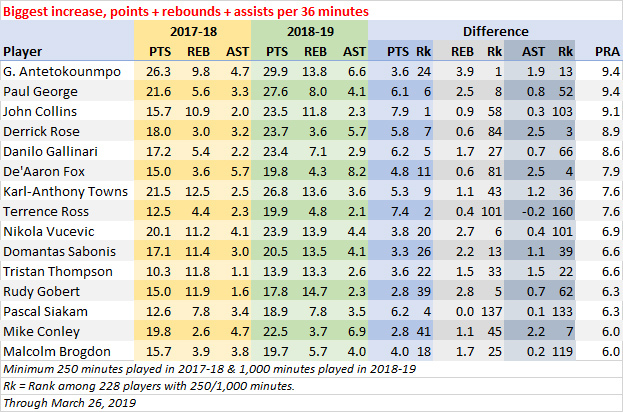 To take the minutes increase out of the math, we can look at points, rebounds and assists on a per-36 basis. Both Giannis Antetokounmpo (two seasons ago) and George (in 2012-13) have won the Most Improved award before. But there's a case to be made that one of them should win it again. Shooting is the most important skill in the game, and one that a player can really improve upon over the course of his career. 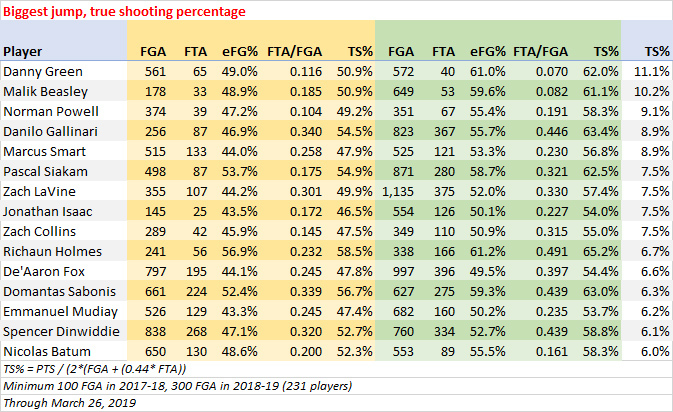 Here are the players who have seen the biggest increase in effective field goal percentage from last season. Three names are on both the effective field goal percentage list and the PRA per-36 list: Danilo Gallinari, Derrick Rose and Domantas Sabonis. Of course, there's more to scoring than shooting from the field. True shooting percentage is a measure of scoring efficiency, taking free throws into account. Here are the players who have seen the biggest increase in true shooting percentage from last season. 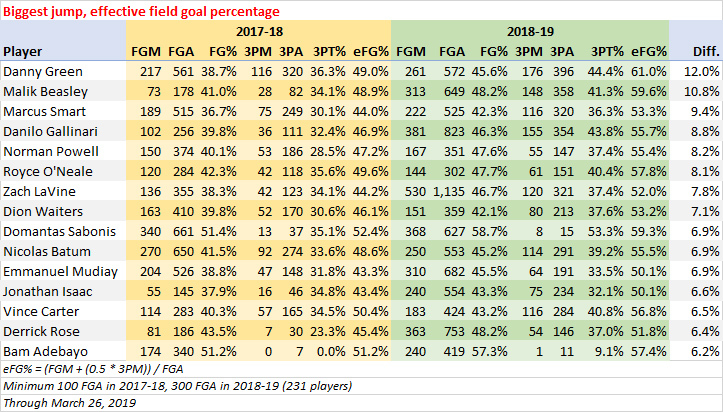 The top five guys on the true shooting percentage list are the same as the top five on the effective field goal percentage list. 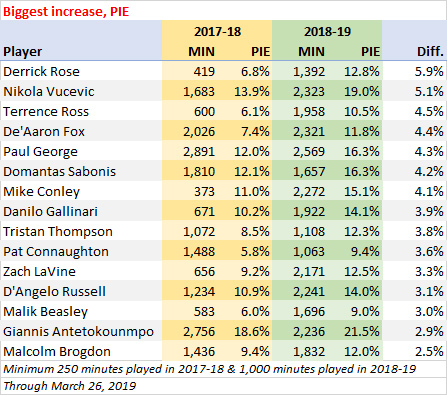 But Pascal Siakam rises from 21st on the eFG% list to sixth on the TS% list, thanks to a big jump in free throw rate, which also helps De'Aaron Fox and Spencer Dinwiddie. Four names are on both the true shooting percentage list and the PRA per-36 list: Fox, Gallinari, Sabonis and Siakam. Antetokounmpo, meanwhile, ranks 34th on the true shooting percentage list, having seen a jump from 59.8 percent to 64.2 percent. George ranks 77th (57.0 percent to 58.6 percent). Rebounding numbers were included in the basics above. 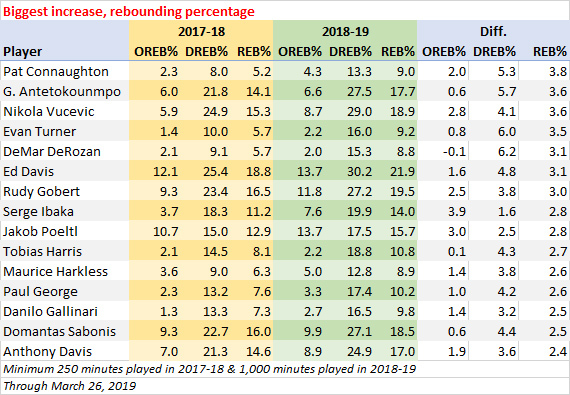 But here's a closer look at the players who have seen the biggest jump in rebounding percentage (the percentage of available rebounds grabbed while on the floor). There are Antetokounmpo and George again. Gallinari and Sabonis are on this list as well. Siakam's rebounding percentage (10.5 percent) is down a bit from last season (10.9 percent). 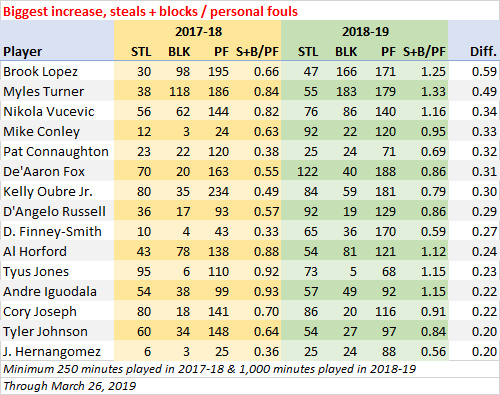 We didn't include steals or blocks in the per-game or per-36 numbers above. We can look at them in comparison to fouls committed, and see how players have improved from last season. Fox is on this list too. Myles Turner is one of two players (Anthony Davis is the other) that have played at least 500 minutes this season with more blocks than personal fouls. NBA.com's PIE statistic takes all of a player's stats as a percentage of all the stats accumulated in the games he played in. The formula can be found in the NBA.com/stats glossary and the league leaders are Antetokounmpo (21.5 percent), Anthony Davis (19.7 percent) and James Harden (19.7 percent). Here are the players who have seen the biggest jumps from last season. Increased usage isn't necessarily a measure of improvement. But it does tell us how much of his team's load that a player is carrying. 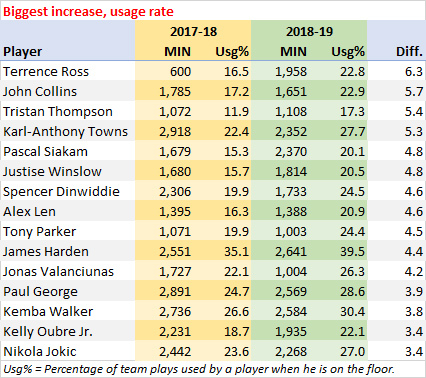 Here are the players that have seen the biggest increase in usage rate. Usage rate looks at who is finishing a possession. But a player could have a high usage rate while being assisted on most of his field goal attempts or trips to the line. Here are the players that have seen the biggest drop in the percentage of their field goals that have been assisted. 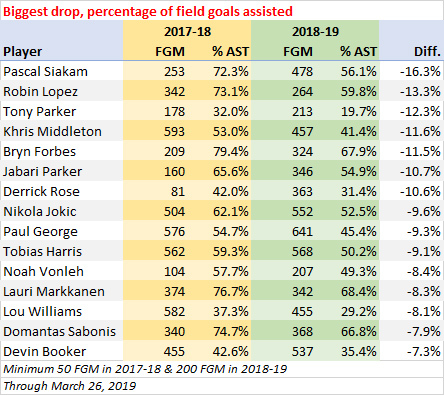 This may be the best statistical case for Siakam as the league's most improved player. He's doing a lot more work for himself than he did last season. For most the calculations above, we used a minimum of 20 games or 250 minutes played last season. Those minimums are somewhat arbitrary, but they're to eliminate small sample sizes that might not illustrate what a player was capable of. Of course, they also eliminated a few interesting candidates - Thomas Bryant (just 72 total minutes played in 15 games last season), Monte Morris (25 minutes in three games) and Derrick White (139 minutes in 17 games) - if you think that second-year players are worth considering for the Most Improved award.